The business administrator, executive assistant, project manager, online business manager, project manager, virtual assistant, entrepreneur and owner behind Virtual Solace. I help C-level executives, business leaders, and small business owners take action, find balance, and gain clarity so they can focus on what truly matters. Owner and Founder of Virtual Solace, LLC. Elise is a seasoned professional with over 15 years experience in business administration, executive assistance, project management, virtual assistance and much more. As a reformed (or recovering) perfectionist, her passion for organization combined with a love of business strategy, systems development and implementation propelled her to launch her own business, Virtual Solace. Since 2012, Elise has been able to provide relief to many C-level executives and business leaders by helping them take action, discover a healthy work/life balance, and gain clarity for their life and business by serving as their virtual executive assistant and online business manager. 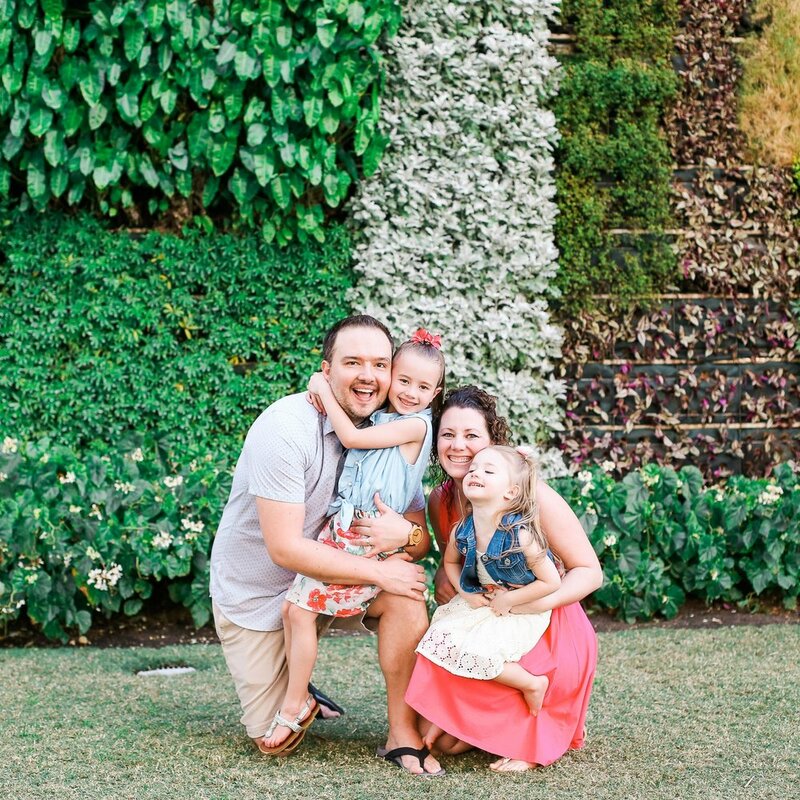 Elise lives in the Kansas City metro area with her amazing husband and their two beautiful girls. You put out fires all day long--taking care of EVERYONE and EVERYTHING on your own. You try to handle it all--only to end up exhausted, overwhelmed, stressed, scattered, or occasionally out of sorts with those closest to you. And how is it that your to-do list is longer at the end of the day than it was at the beginning? I know what it's like to try to keep all the balls in the air. I’ve felt the need for peace in the midst of a storm. And, I know what it’s like to build a business from the ground up. There is always more to be done and something else to learn. I’m thrilled you’re here—because we’re a lot alike, you and me. You see, we’re both trying to create a life we love out of what we do, which means neither of us can avoid our most valuable resource: our time. At the top of this page, I told you I wear many hats, including that of a business administrator, executive assistant, project manager, online business manager, project manager, virtual assistant, entrepreneur and small business owner here at Virtual Solace. All the above is true, but I am also a busy wife and mother of two little girls. Although our stories may not be identical, I can guarantee this: I understand where you are coming from and what your needs are. I learned how to build and manage my business, support my family, and create the lifestyle I desire for my family even when the circumstances are challenging--because I don’t give up. I know what it’s like to be on the receiving end of one of life’s curveballs. But I also know what it’s like to overcome them. I can relate to where you are at, but, more than that, I’ve learned to push through difficult situations and have proven myself to be better because of it. Most of all, I’ve learned the joy and peace that comes with a simpler life--one that allows me to breathe, laugh, and relax. Now, I offer business leaders simple and strategic methods to take action, move their business forward, develop a healthy work/life balance, and gain clarity for themselves and their business so they can feel what I feel. I work exclusively with C-level executives and business leaders to provide solace and implement small changes in their life and business so they can leave space for what truly matters. I serve as a trusted and valued resource you can turn to when your to-do list is keeping you up at night. How did I realize this? Because I’ve been right where you are and I’ve asked those very same questions myself, but more than that, I’ve helped many of my Clients, who have been right where you are, delegate tasks so their minds can rest. After years of serving as an executive assistant, events coordinator, project manager, and overall doer of many things, in 2009, I began my journey as an independent contractor working for for a few of my previous employers in both the for-profit and not-for-profit sector. In 2012, after my eldest daughter was born, I transitioned my role to serve as a virtual executive assistant for C-level executives which allowed me to continue to wear my professional hat while also taking time to enjoy the quickly fleeting moments with my family. As time went on, my business grew from doing business as "Elise Finger" and morphed into what is now the Virtual Solace brand. Now my business is two-fold. It started as a way to wear my professional hat while allowing me to spend more time with my family and care for my children young, but now it has grown to allow me to also partner with C-level executives, business leaders, small business owners, and other entrepreneurs to help their business thrive. Not only is that my business, it’s my passion. In my field, I am always searching for helpful resources to point me in the right direction, and I’ve often struggled to find clear systems and strategies I could implement simply. My hope for the Virtual Solace brand is to serve as a simple and clear resource in those moments of overwhelm so you can avoid trying to figure everything out by trial and error. If I come across effective tips and strategies, my goal is to share them with you on the Virtual Solace blog or directly to my email subscribers. My philosophy, in brief, is to love God, love people, and to equip others to intentionally live their lives to the fullest (John 10:10). Mom to two little ladies (ages 6 and 3). Lover of the perfectly seasoned steak and homemade chocolate chip cookies. Highly organized planner by nature. Coffee fan (did I mention I have two kids?). Why does all of this matter? Because I’m your advocate, partner, and virtual extension of your business. As an virtual executive assistant and online business manager, I do more than manage tasks, schedule travel, maintain your inbox, and organize your calendar (although I do those things, too). I strategize with my Clients to see how we can achieve the action, balance, and clarity they desire for themselves and their businesses. My years of experience have lead me to this moment: our meeting. I'm so glad you're here and I hope you find the Virtual Solace site helpful, whether it's a blog post, email campaign, course, or by having the opportunity to serve you and your business. ARE YOU READY TO STOP WASTING TIME AND FIND VIRTUAL SOLACE?